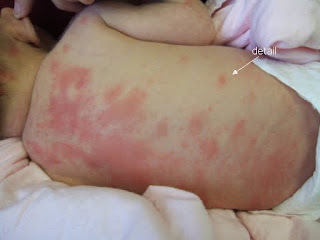 This rash usually appears after 24-48 hours after birth and can appear up to the 10th day of life. This is a benign and self-limiting condition with the cause unknown. This was called as "flea bites of the newborn"because it is very similar to how flea bites look like. The rash are usually 2 to 3cm in diameter and you can have vary from a few lesions to a hundred and when you look closely you will see a central pustule or papule. This can be found on the face, arms, back, chest and abdominal area. The palms and soles of the feet are spared. This usually resolves in 5-7 days of age and no treatment is necessary.